Smith & Beck Compound Binocular Microscope, 6 Coleman St., London, no. 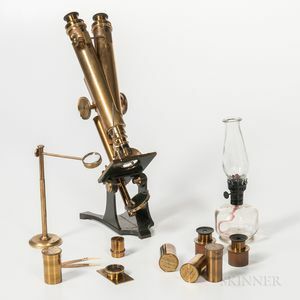 2870, lacquered brass instrument with tubes engraved as above, coarse and fine focusing, round pillar, simple square stage, and plano mirror, two objectives in signed cases, two eyepieces, colorless glass oil lamp, and associated accessories, ht. 16 1/2 in.